We are raising money to pay for the unexpected death of my cousin's who lost their lives in a fire while at home yesterday. 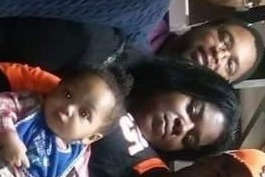 My cousin, her husband, and her son were found in their home dead 10 days after their death. No one knows what happen or how but the pain still hurts all the same. My cousin was a good mother, good wife, friend, and family member. She had a voice like a Angel! If you ever met her you will never forget her because she would leave a impression on you whether you wanted it or not. I love her and she will be missed dearly! Rest in Heaven sweet angel!